Update I have taken down the site as I don’t have the time to update it in line with a couple of changes to PrayerMate and I would like to encourage you to support the crowdfunding initiative towards an official web interface. PrayerMate is an excellent app designed to manage the poeple and things you would like to pray for. Being a mobile only app, it can get rather tedious trying to initially input (or mass update) all the things you would like to pray for as one has to type away on a small on screen keyboard. So I thought this was a good reason to build by first Flask site: Batch PrayerMate. It is pretty basic, but it works and now you can fill in your prayer points much much quicker with a full sized keyboard! 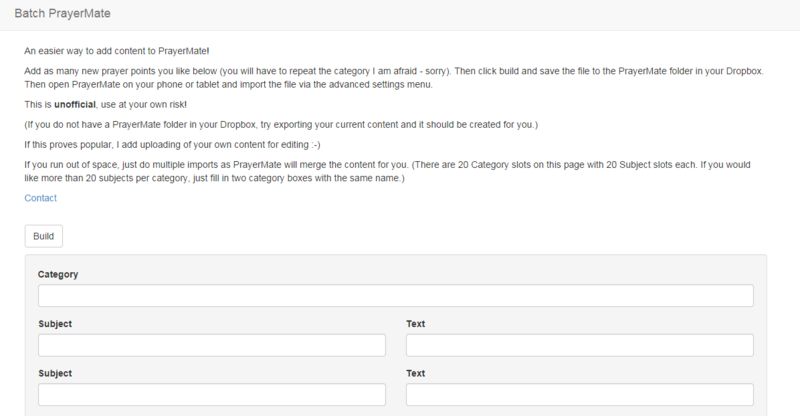 So try it - fill in who and what you would like to pray for, then download your file and import it into PrayerMate. Please let me know if you find this useful or if there are any issues. I might try and tidy up the design and possibly allow importing of your existing set of prayer points - that should be easy enough to do. One other caveat - it looks really rather ugly on Firefox, so I recommend that you use Chrome.